Frisco-built 4-8-2 4402 at Monett, Missouri on September 19, 1948 (Arthur B. Johnson). 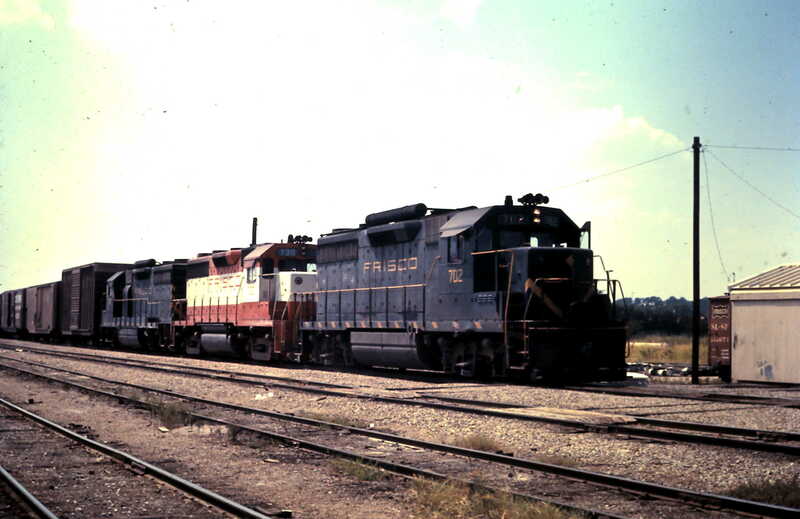 GP35s 702 and 730 (date and location unknown). GP38-2 467 and SD45 902 at Memphis, Tennessee in May 1980 (David Ingles). The photograph was taken at the Frisco’s Tennessee Yard. This is the Mechanical Department’s service tracks area. 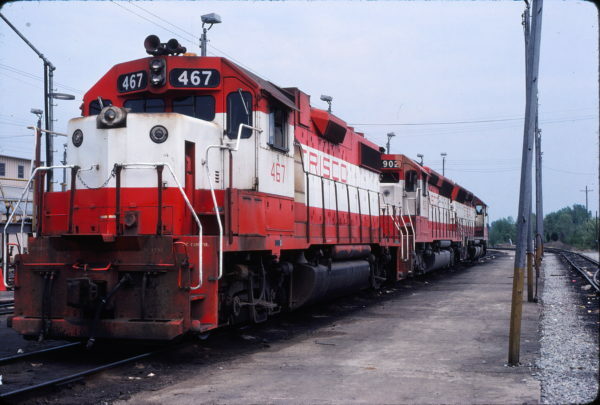 To the left of the locomotives is the diesel shop with it’s single upper windows. It is unlike the newer shop in Tulsa, Oklahoma which has groups of three windows. 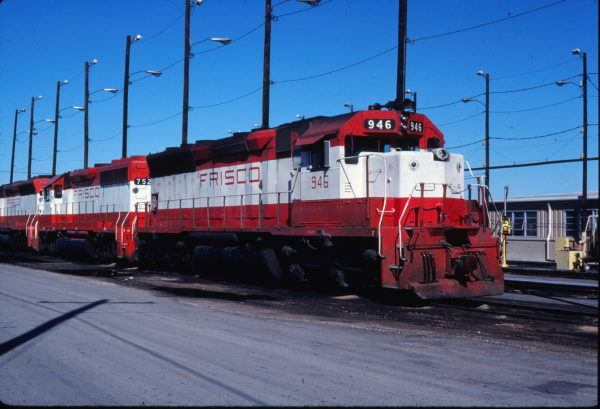 In the far distance, to the right of the locomotives and left of the wooden poles, is the locomotive turntable. 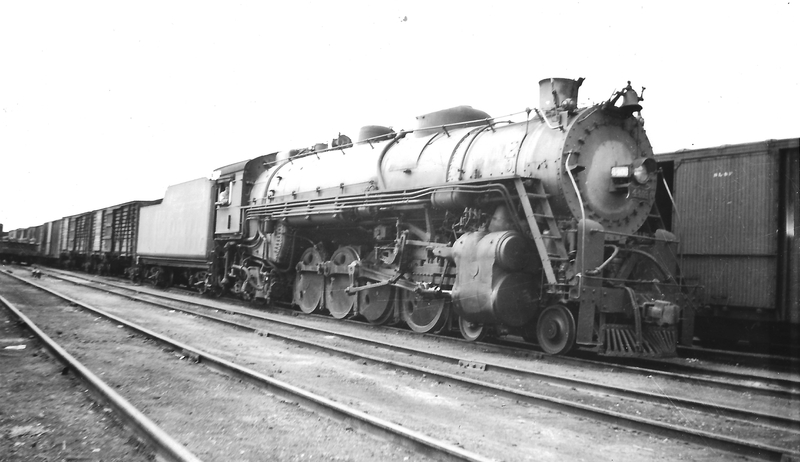 In this view you can see one of its silver sides and the electrical connection arch. It is located at the south end of the service tracks area. 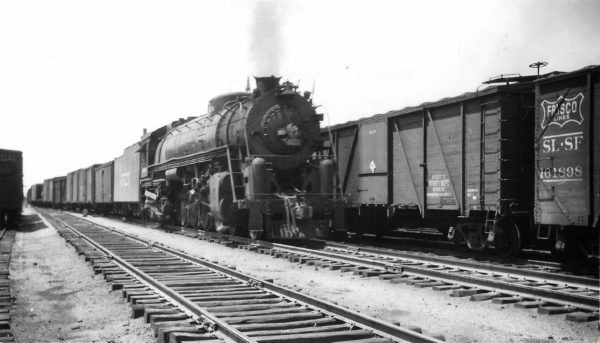 Closer to the photographer, the turnout just visible to the right of the wooden poles leads to the original main line (passenger main) which bypasses the Tennessee Yard complex. The view is looking southeast. 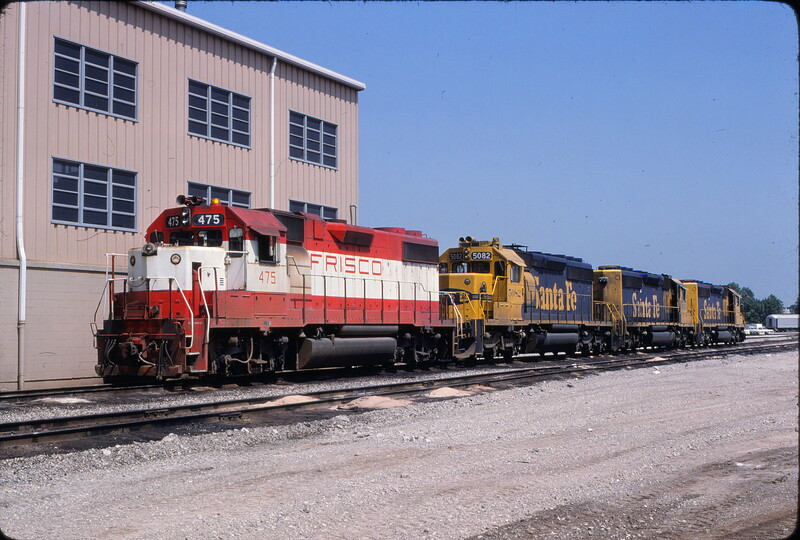 SD45 946 and GP40-2 752 at Tulsa, Oklahoma on September 20, 1980 (Gene Gant). 4-8-4 4523 leaving Springfield, Missouri destined for St. Louis on March 14, 1948 (Arthur B. Johnson). 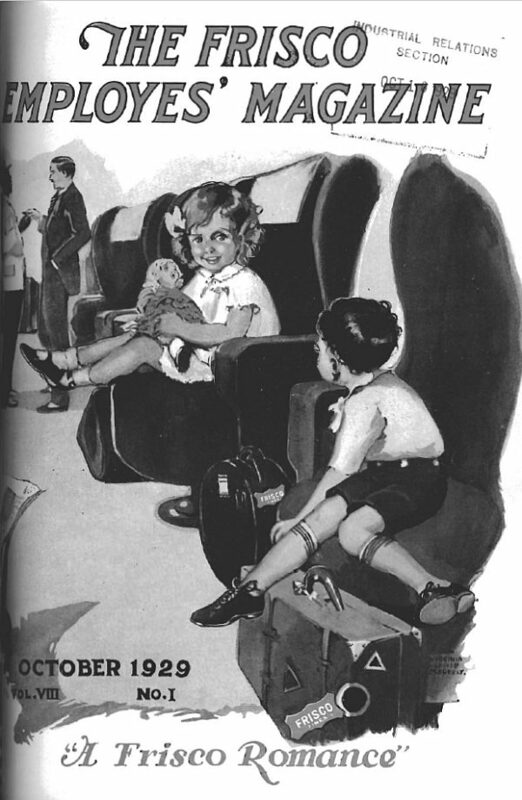 Frisco Employes’ Magazine – October 1929 (PDF). 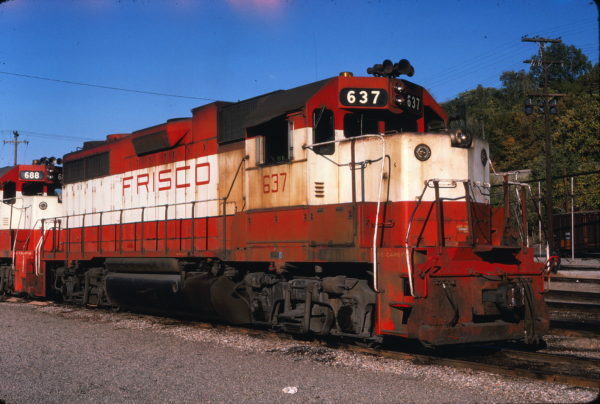 GP38AC 637 at Kansas City, Missouri on October 23, 1978 (Jim Wilson). GP38-2 475 at Tulsa, Oklahoma on May 24, 1980 (Allen Clum). 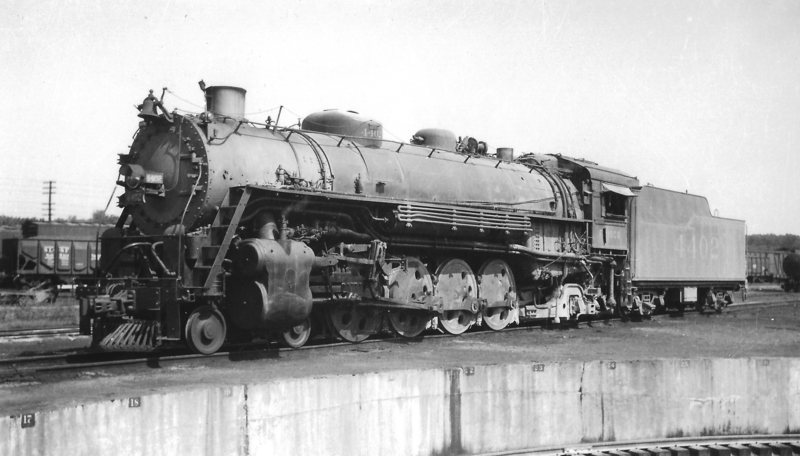 Frisco-built 4-8-2 4409 at Tulsa, Oklahoma in September 1946 (Arthur B. Johnson). 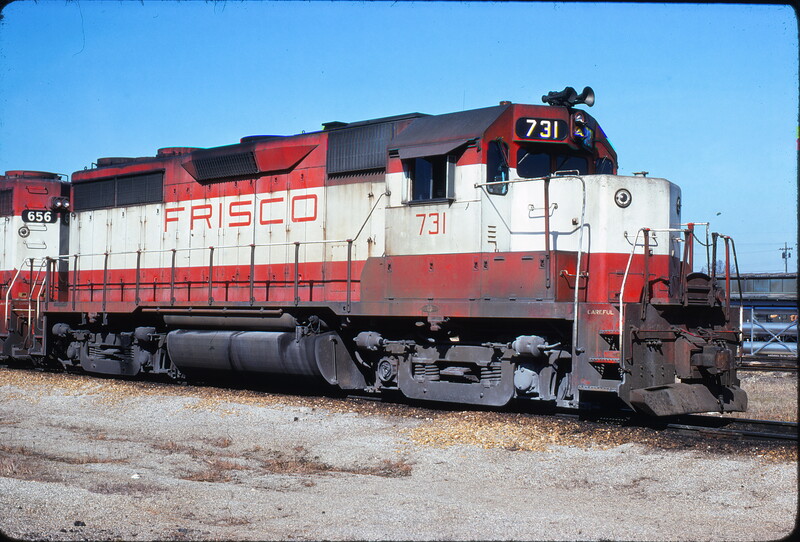 GP35 731 at Memphis, Tennessee in February 1976 (Steve Forrest).